The main house was built for the Roman owners from 1837 to 1839 and took nearly three years to complete. It was a gift from Jacques Telesphore Roman to his bride Celina, although it is rumored to have been designed by Celina's own father, Gilbert Joseph Pilie. 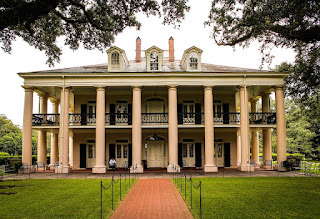 Constructed mainly by slave labor, the building materials were mostly found on the plantation grounds, although finishing touches were imported from other places in the United States and Europe-most likely France at the time. It was for Celina that the back oak alley was planted so that she would feel that her new country life on the plantation could be just as grand as what she was used to from living in her father's house in New Orleans.